The Wireless USB 11N Nano Adaptor 802.11N (WiFi Dongle) is the perfect solution for getting your Raspberry Pi on the internet wirelessly. Unlike ordinary wireless networking technologies that are confused by signal reflections, the 802.11n’s MIMO (Multi Input, Multi Output) actually uses these reflections to increase 4 times range of 802.11g and reduce "dead spots" in the wireless coverage area. It complies highly with IEEE802.11g/IEEE802.11b standard, but when both ends of the wireless link are Wireless-N, the speed can be increased even 3 times of 802.11g by using twice as much radio band. 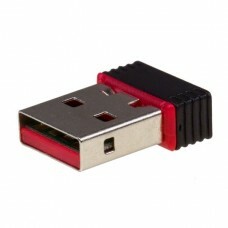 This nano WiFi dongle utilises the Ralink 5370 Chipset. Can be powered direct from the Raspberry Pi or from a powered hub.